Home > About, Department of Informatics, Informatics Revolution, Robotics	> Informatics Revolution! 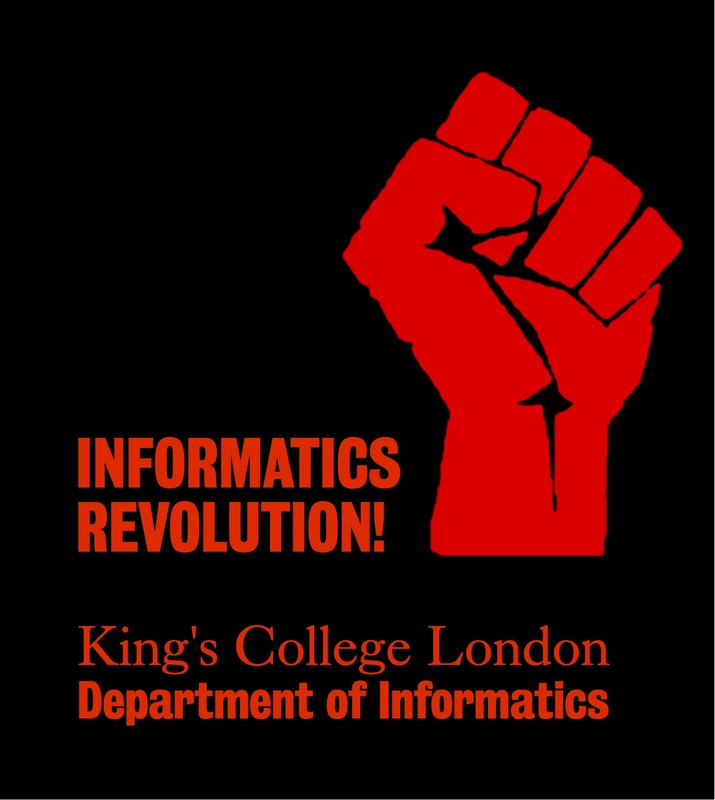 It’s the start of a new academic year, and we in the Department of Informatics at King’s College London are welcoming back our returning students as well as new cohorts of undergraduate, MSc and PhD students. As part of our induction process, we have student “buddies”, volunteers who show the new students around and introduce them to the Department and the College. This year, our buddies are easily identified, wearing the T-shirts that mark them out, emblazoned with the words “Informatics Revolution”. So what is this Informatics Revolution? In one sense, it’s self-evident that informatics, which is concerned with the representation, storage, processing, and communication of information, has fundamentally changed the nature of our lives. Not just once, but time and time again, and it will continue to do so. As I write this blog entry, I think little of the wireless access to the Internet that my laptop permits, nor of the social media I’m using through this blog and the Facebook and other posts it will generate. Rather than my laptop, I might use my mobile phone (sadly not a phone with 4G – another revolution – or voice activated control) or tablet computer, and perhaps in two years time there will be another alternative. Today we delegate control to programs on these devices, and tomorrow we may do the same with robotic devices. All of these aspects are part of what makes up the Department of Informatics at King’s, from foundations underpinning such developments to the practical aspects of developing and deploying them. Revolutions again and again. At King’s we’re working on robotic surgeons, on cybersecurity, on sequencing genomes, and on autonomous systems. Each one a revolution. But Informatics Revolution is more than that. Here at King’s it’s an idea that provides a vision for what we can achieve, for both staff and students. This is the point in time at which the Department of Informatics has taken its final form, with the integration of our Centre for Robotics Research, joining our groups on Planning, Agents, & Intelligent Systems, on Algorithms & Bioinformatics, and on Software Modelling & Applied Logic, bringing a breadth and depth of research that is not common. The revolution begins here in providing the full range of what informatics covers within a single department. Perhaps more importantly, we are a department that provides research and education that we believe is excellent and getting even better; the recent QS World University Rankings placed King’s 7th on the list of UK institutions for Computer Science! We are a department that is committed, through the energy and efforts of our staff, academic, administrative and technical, to sustaining and improving our provision. We are a department that seeks to engage our students, and to work with them (and to have them work with us) on driving forward to ensure our environment and our culture are vibrant and stimulating. Informatics Revolution is an idea that underpins a vision of shared contribution and achievement for both staff and students in a revision of traditional models of staff teaching students and students receiving that teaching. Together we will make it happen.